We hope you have been enjoying our eight part series on railways of the United Kingdom. 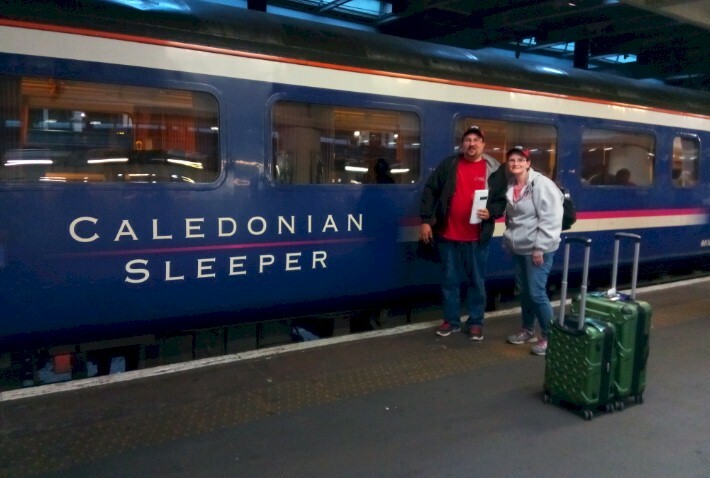 Can you believe it's already the first week of October... and we are halfway through our England/Scotland Rail report series already with this one on the Caledonian Sleeper? 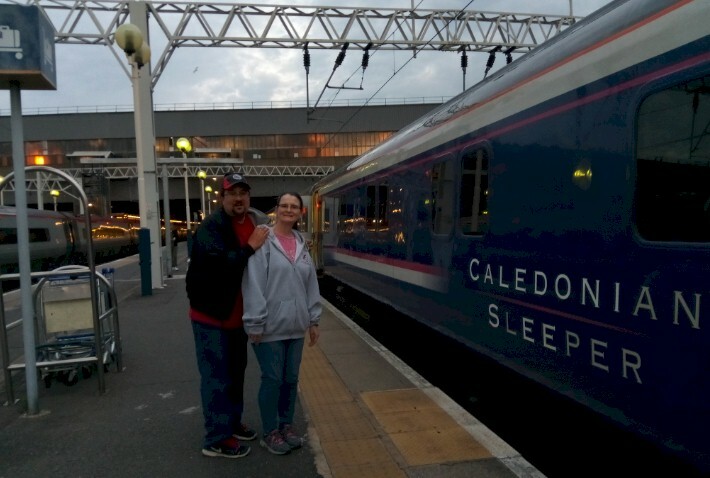 After spending four days in the London area, we decided to use the northbound ‘Caledonian Sleeper’ to reach the Scottish Highlands… where we would be spending an additional week sightseeing and riding four more trains. On the evening of Monday, May 21, 2018, we checked out of our London hotel, had dinner with… and said goodbye to… our friend Stacey, who served as a wonderful host for a portion of our visit to London. 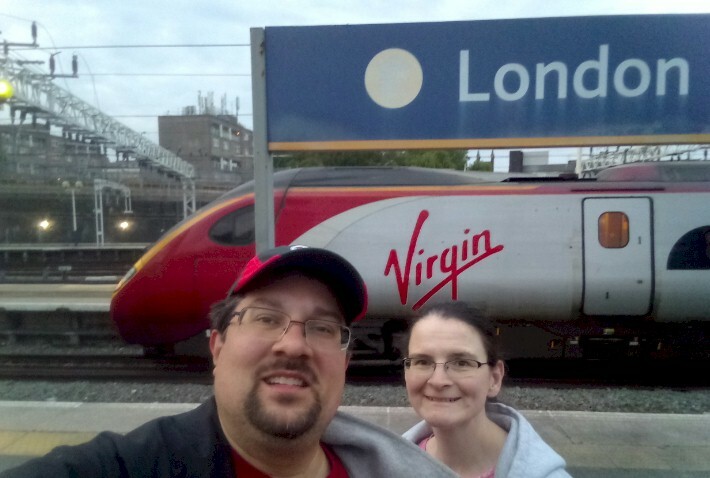 From there, we made our way to London’s Euston Station. Euston was the first inter-city railway terminal in London, planned by George and Robert Stephenson. The original station was designed by Philip Hardwick and built by William Cubitt, having a distinctive arch over the station entrance. The station opened as the terminus of the London and Birmingham Railway (L&BR) on July 20, 1837. Euston was expanded after the L&BR was combined with other companies to form the London and North Western Railway, leading to the original sheds being replaced by the Great Hall in 1849. Capacity was increased throughout the 19th Century from two platforms to fifteen. The station was rebuilt in the mid-1960’s, including the demolition of the Arch and the Great Hall, to accommodate the electrified West Coast Main Line. Today, Euston is the fifth busiest station in Britain and the country’s busiest inter-city passenger terminal. Euston had the feel of modernized Penn Station in New York City, compared to Paddington… which had more of the feel of Grand Central. 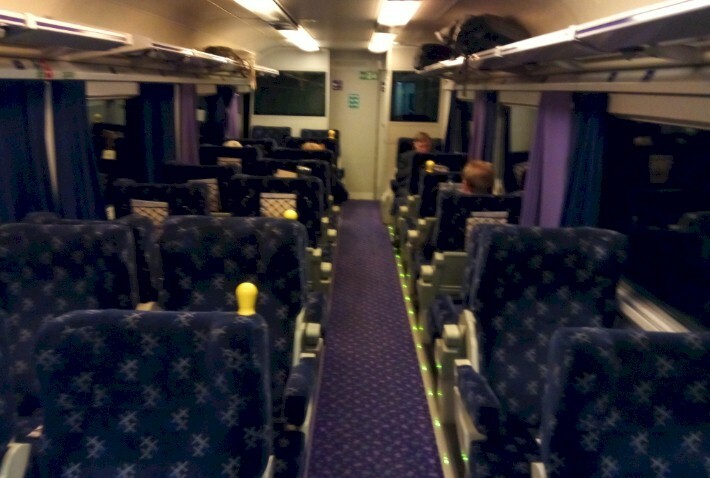 Both of the Caledonian Sleeper trains operate on what is called the “West Coast Main Line” (WCML), recognized as one of the most important railroad corridors in England and Scotland. It connects London which such major cities as Birmingham, Liverpool, Manchester, and Glasgow. This makes the WCML one of the busiest mixed-traffic railway routes in all of Europe, carrying a mixture of intercity rail, regional rail, commuter rail and rail freight traffic. In fact, 40% of all freight traffic in the United Kingdom uses this route. 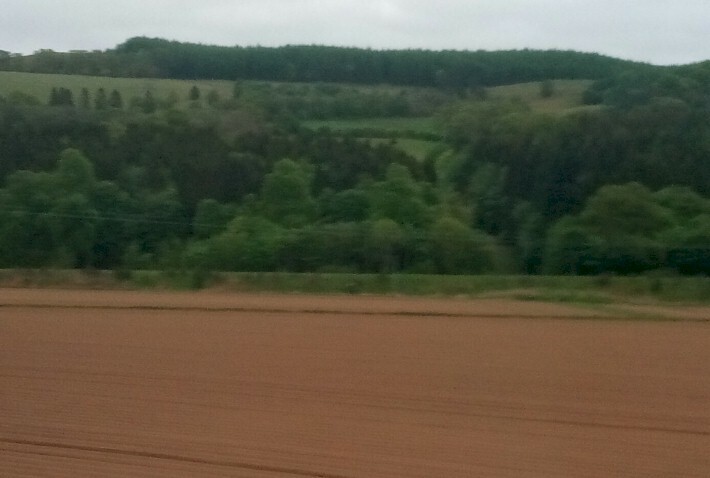 The core route of the WCML runs 399 miles from London to Glasgow. The WCML also has another 300 miles worth of branch lines that diverge to Northampton, Birmingham, Manchester and Liverpool. 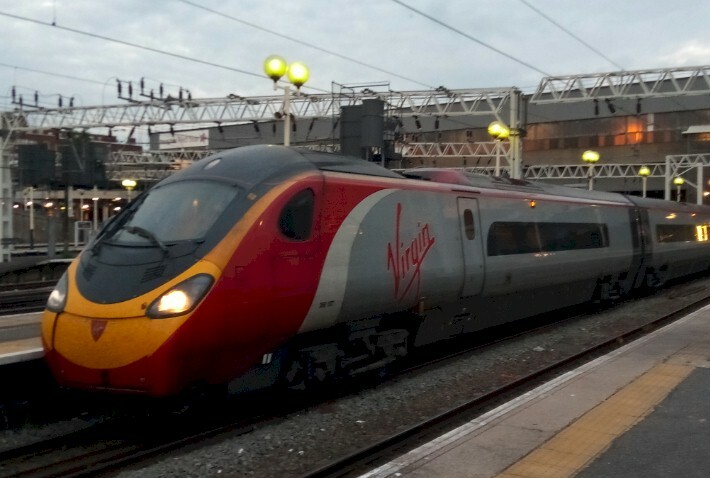 Much of the line has a maximum speed of 125 mph, however only certain Virgin Trains with tilting mechanisms go at this speed; other traffic is limited to 110 mph. 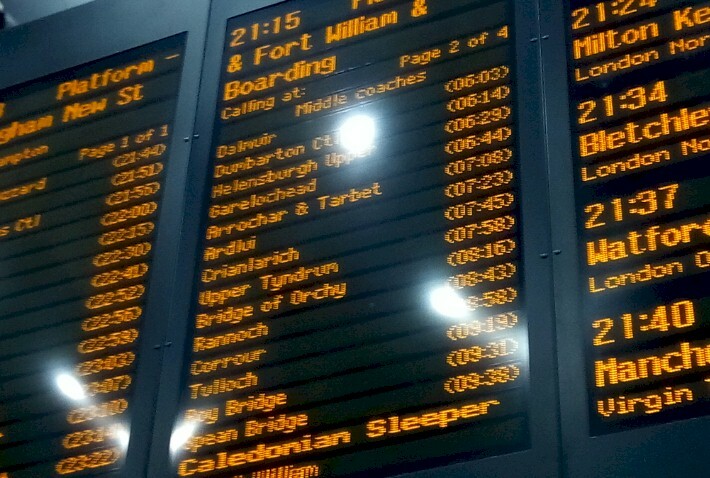 The Caledonian Sleeper goes even slower most of the time to offer reasonable arrival times for sleeping car passengers. A number of different train operators currently use the “West Coast Main Line”. 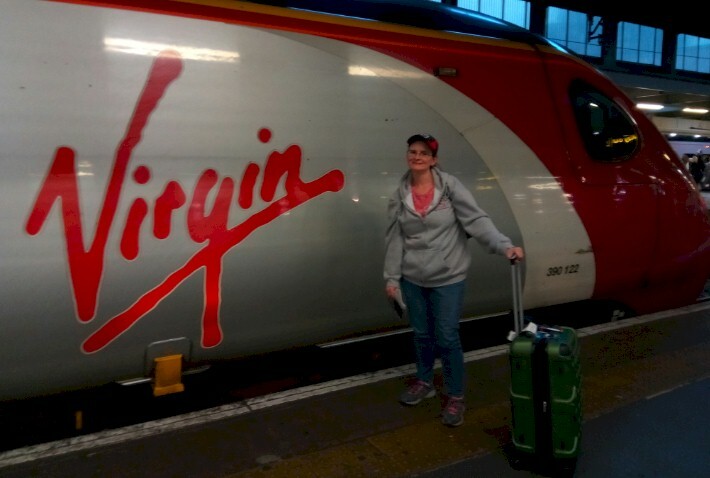 Virgin Trains is the most frequent passenger provider on the WCML, with service between London-Euston Station and Manchester (Piccadilly Station), Birmingham (New Street), Liverpool (Lime Street), Chester, Holyhead, Glasgow (Central), and Edinburgh (Waverly). West Midland Trains, operating under the London Northwestern Railway brand, provides commuter and long-distance services on the route between London-Euston Station and Birmingham. We saw several of these trains departing from London-Euston Station while we were waiting to board the Caledonian Sleeper. That’s not even close to being all of the train operators, either! As part of its North West route, TransPennine Express provides services along the WCML from Manchester Airport to Glasgow and Edinburgh. Southern provides an hourly service between East Croydon and Milton Keynes Central. London North Eastern Railway currently operates one train per day on the WCML between Glasgow Central and London King’s Cross via Edinburgh (Waverly). Cross Country operates service between Plymouth, Bournemouth, and Bristol Temple Meads to Manchester (Piccadilly Station). 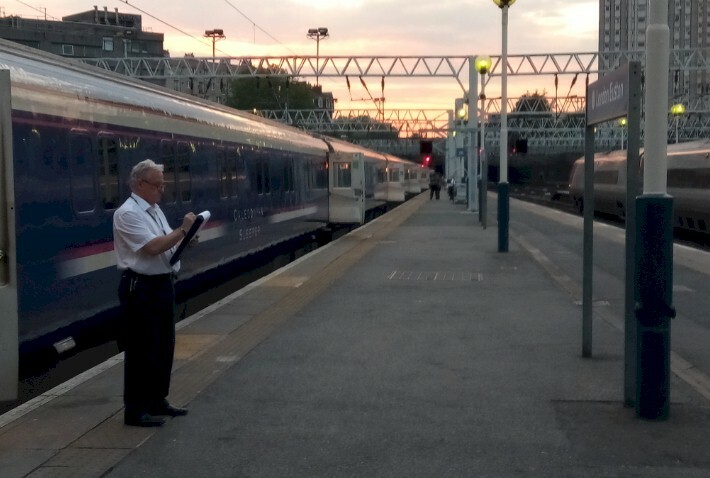 ScotRail operates services on sections of the WCML… and of course, last but not least, our own Caledonian Sleeper operates services down the length of the WCML, providing overnight service between London and Scotland. You get the point… the “West Coast Main Line” is one busy place for trains! Getting back to our ride… we would be traveling in a sleeping car that was called a Mark 3 carriage. 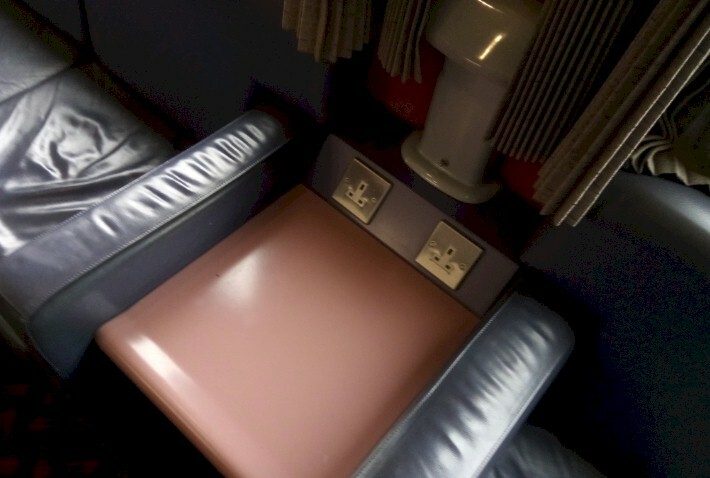 This series of sleeping cars was built between 1975 and 1988… and had been used on the Caledonia Sleeper since its inception in 1996. 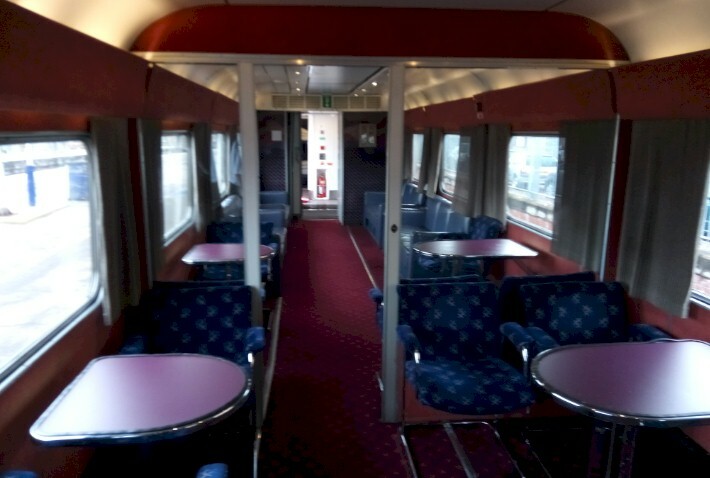 The lounge cars on our train and the ‘seated sleepers’ (basically nice coach cars) were from the Mark 2 series, which were even older… built between 1969 and 1974. The equipment is soon to be replaced later this year by Mark 5 carriages (more on this in a bit!). 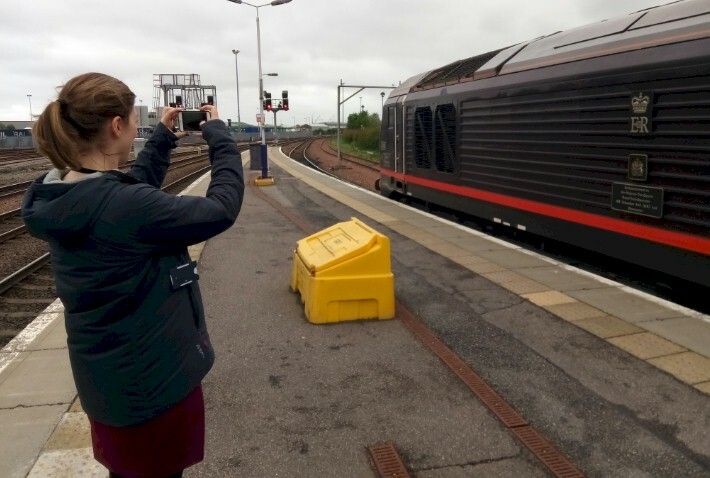 Initially, there was some hope we could get to ride in the new Mark 5 cars when we booked the trip; however there was a slight production delay… which meant we would be traveling in the older cars on our trip between London and Inverness. 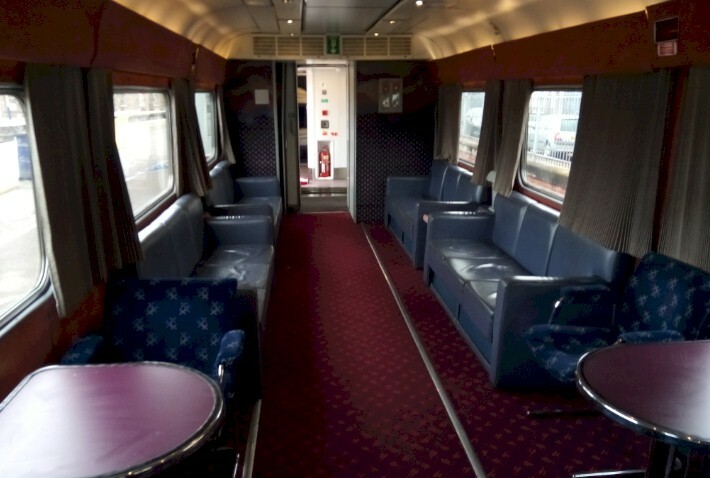 Unfortunately, the lounge car that was serving the Inverness section of our train had no air conditioning and was closed off to passengers (it was very hot and humid in there!). 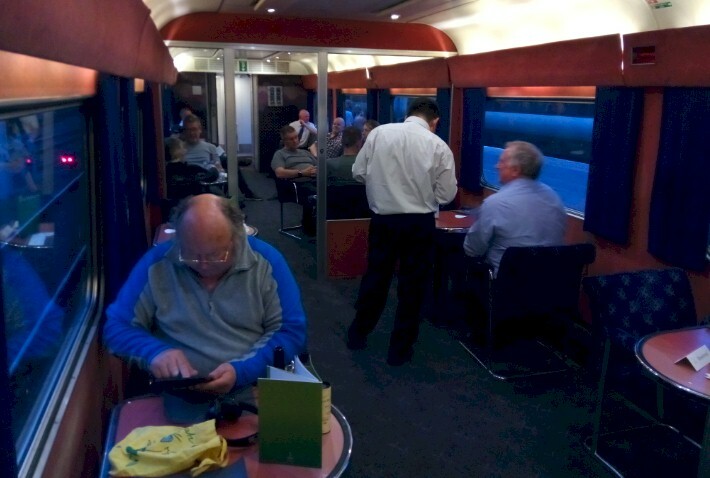 We were allowed to visit another lounge car… however there was no seating… so we had to get our evening meal and night cap ‘to go’ and take it back to our room. 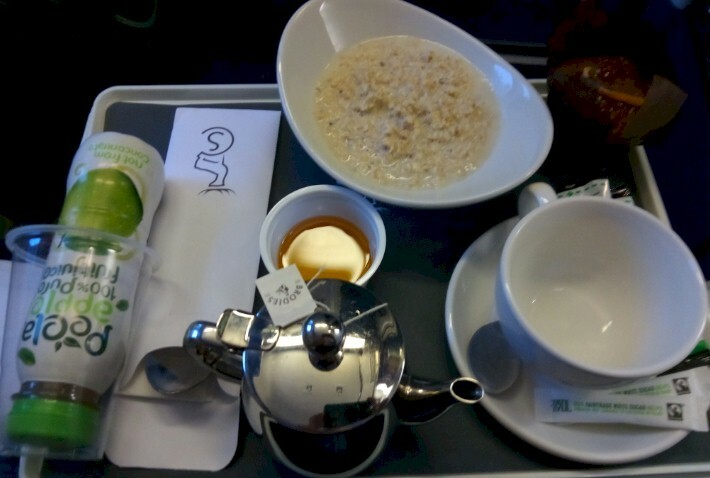 Breakfast would also be handled the same way, as the crew was not able to get our lounge car fixed. American travelers should not forget their power converters! Even though the U.K. is down to two routes that have sleeping cars... it’s still a respected tradition that goes back more than 145 years for the Brits. In fact, it was in February 1873 the North British railway displayed the first sleeping car to run in England and Scotland. It had been built by the Ashbury Carriage Company, and was displayed at Glasgow, Edinburgh and London King’s Cross Station. It earned the title as the first sleeping car used on British railways when it made its first revenue earning trip on February 24, 1873 when it was attached to a train at Glasgow for King’s Cross. Later that year, the Caledonian Railway introduced a sleeping car, built by the London and North Western Railway, on limited mail trains three days per week between Glasgow and London. 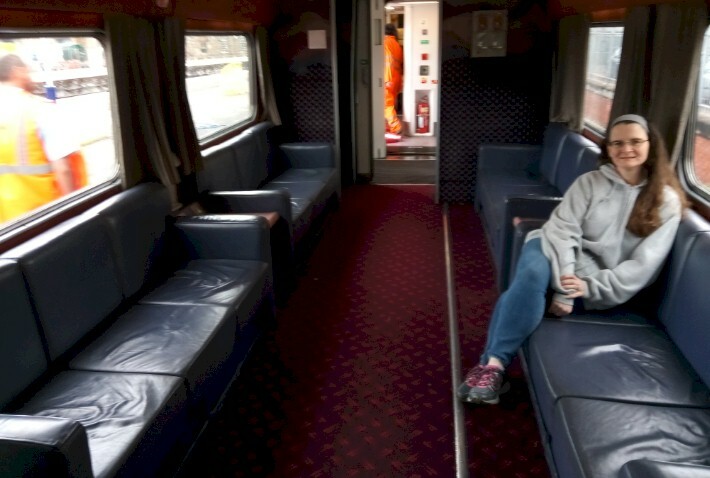 Sleeping car service was almost scrapped altogether when the railways in England and Scotland were privatized in the mid-1990’s. The introduction of short, budget-priced airline flights around the same time also didn’t help matters. 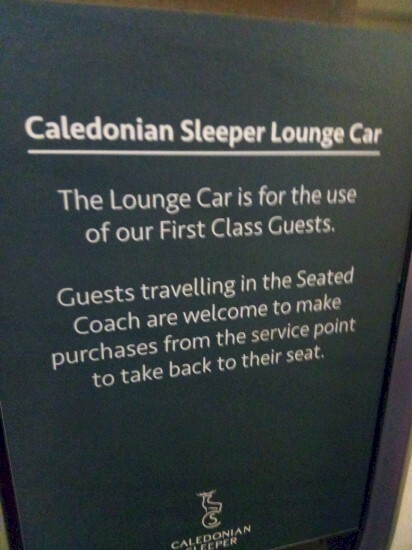 However, the Caledonian Sleeper has hung on. The service has been fighting back against the airlines with better on board services – and passenger numbers have grown as a result (maybe this is something Amtrak should consider!). 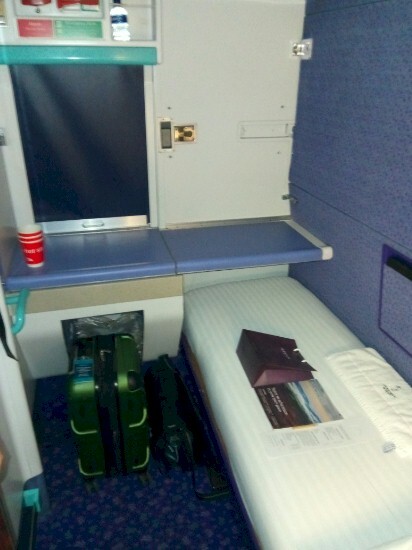 Better food and drink, softer mattresses, snug duvets replacing blankets and much easier booking systems have improved the sleeper experience according to the Caledonian Sleeper’s senior officials. U.K. firm Serco, which runs the Ghan and Indian Pacific trains in Australia, currently has the sleeper contracts. We headed to bed a short time after finishing our meal… and slept very soundly. The only time we woke up was around 3:00am when the train was being broken up into smaller sections at Edinburgh. The ride was very smooth and even the switching of cars resulted in just a quick wake-up. The next thing we knew, we were about 90 minutes out of Inverness… with the sun rising over the beautiful Cairngorm Mountains. 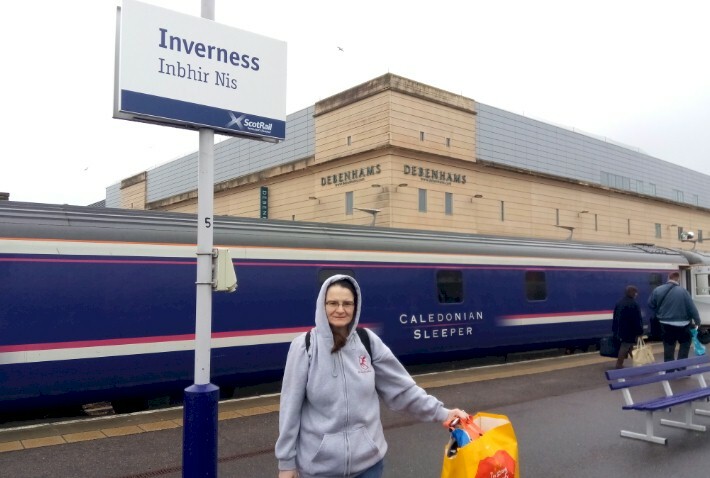 After arriving in Inverness, we headed into the Caledonian Sleeper’s First Class Lounge (located across the street from the station) in order to take a quick shower and freshen up a bit. 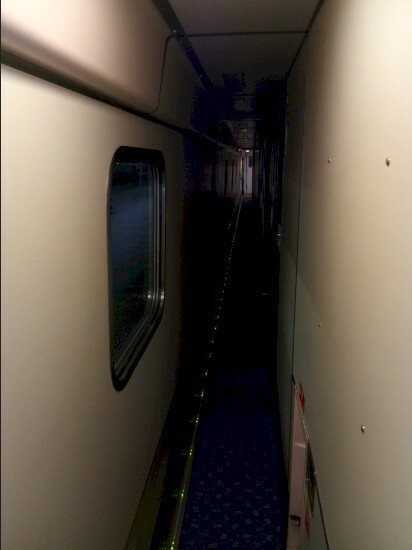 Since the train ride is so short, there are no actual showers on the train… however First Class customers can use the private shower rooms at the terminal station, if so desired. They were really nice and featured all of the amenities one would need. 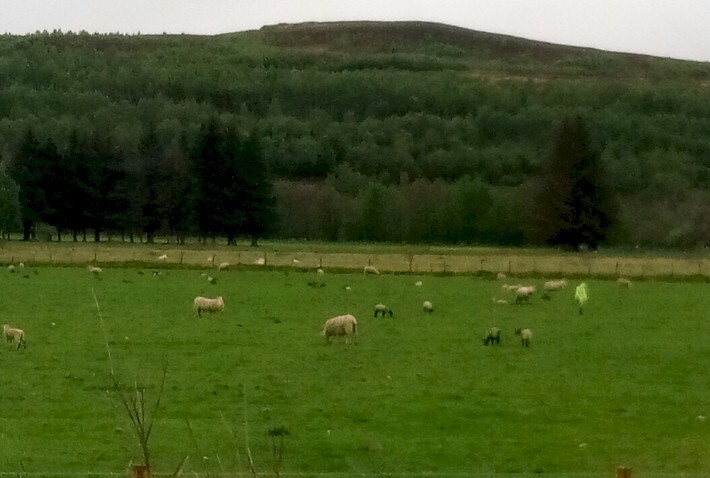 Waking up in the Scottish Highlands! A wonderful breakfast brought to our room -- no plastic cups or forks here! Look at the lovely tea pot! We arrive in Inverness -- right on time! 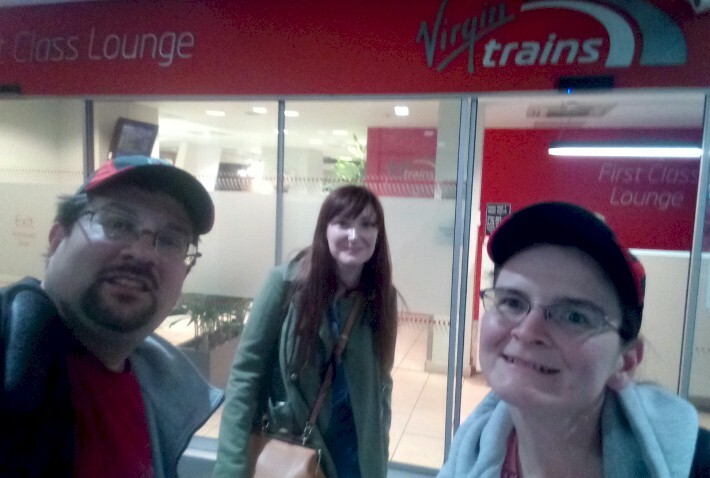 After grabbing a snack and some water back at the station, we were met by Derek Thompson (Caledonian Sleeper’s Retail & Pricing Manager) and Kim Thain (Caledonian Sleeper’s Marketing Manager). 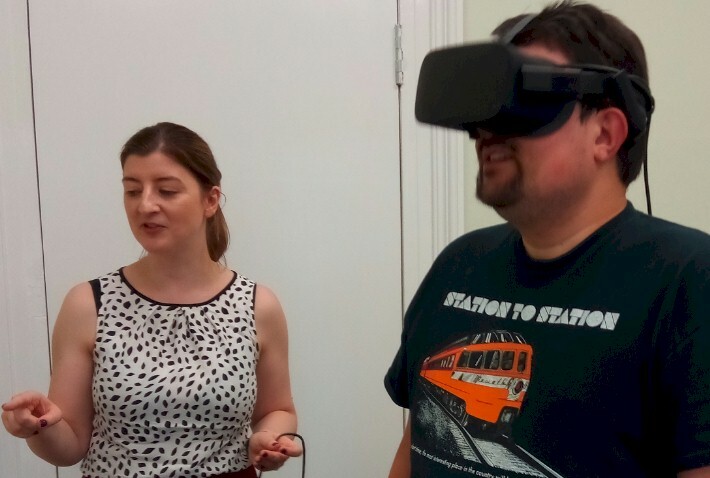 We got to spend about an hour with Derek and Kim to learn more about the train service… and then… we were surprised when they asked us if we’d like to take a virtual reality tour of the new train equipment that would be coming out later that fall. 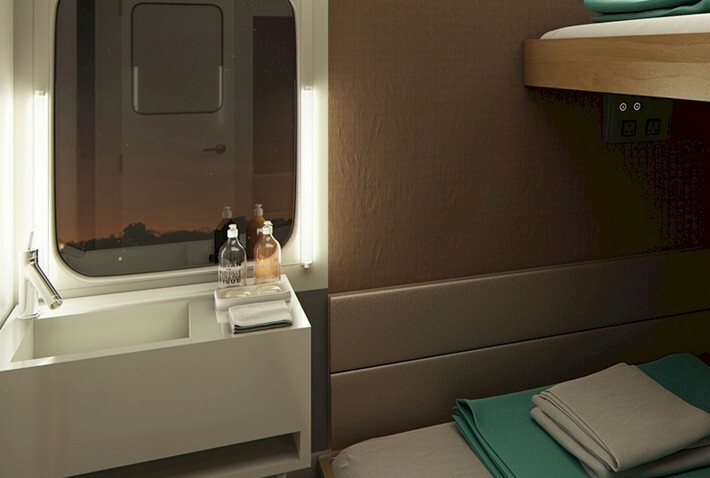 Created by digital media studio Soluis, the virtual reality tour actually allowed us to walk through the Club Car and discover the rooms on the new trains, a number of which will be en-suite. 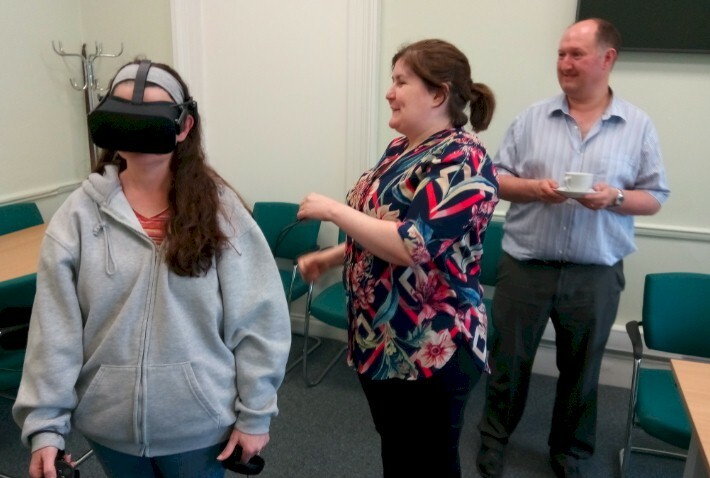 It was quite an experience and the first time either of us had used virtual reality technology like this. You were instructed not to move your feet (so you don’t bang into walls!) but it was hard not to do when what you were seeing appears so realistic! You could open doors virtually and walk up steps. 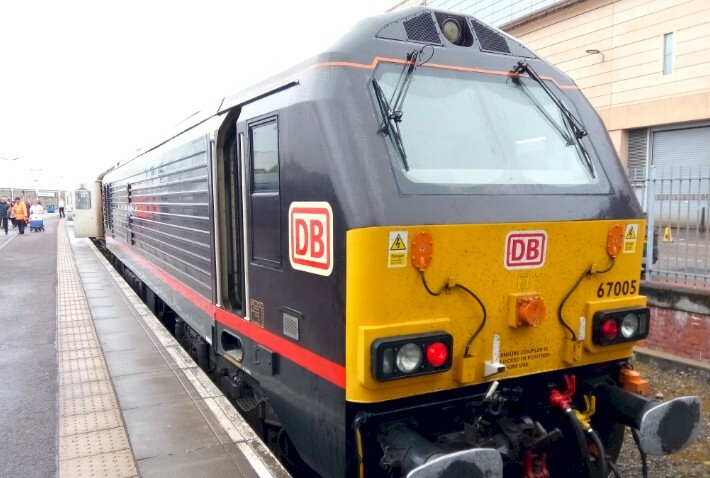 The trains will initially be introduced on the Lowlander route between Glasgow / Edinburgh and London later this month. 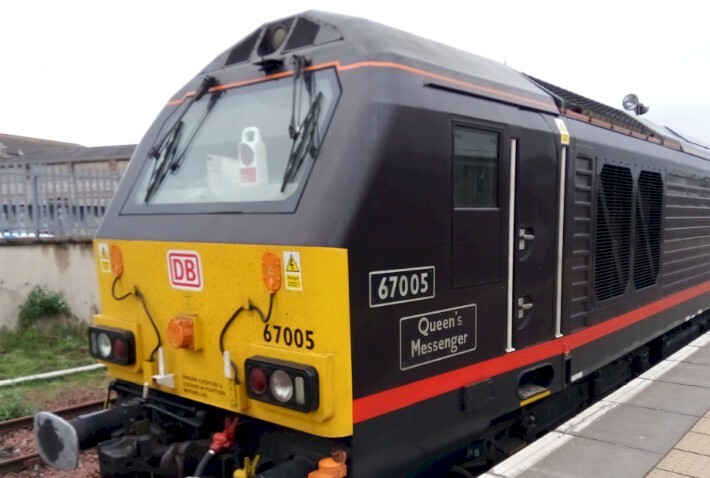 They will then be a phased in on the Highlander route (which we took during our visit), which, again serves Fort William, Aberdeen and Inverness. 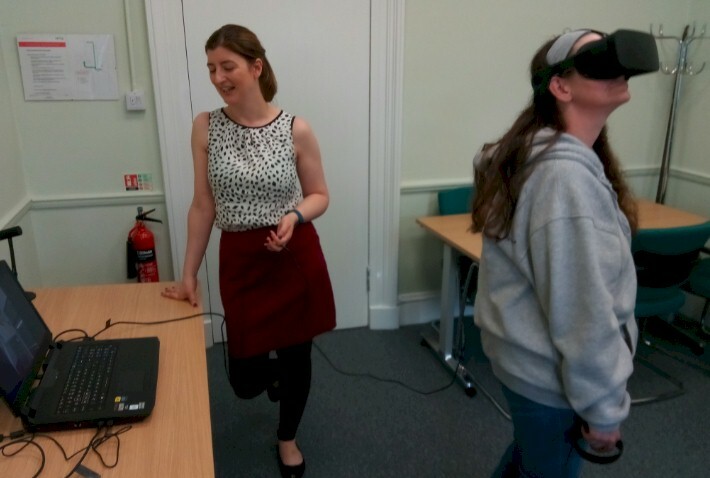 A special meeting with the Marketing Team of the Caledonian Sleeper allowed us to see the new rail equipment thru virtual reality headsets - very cool! 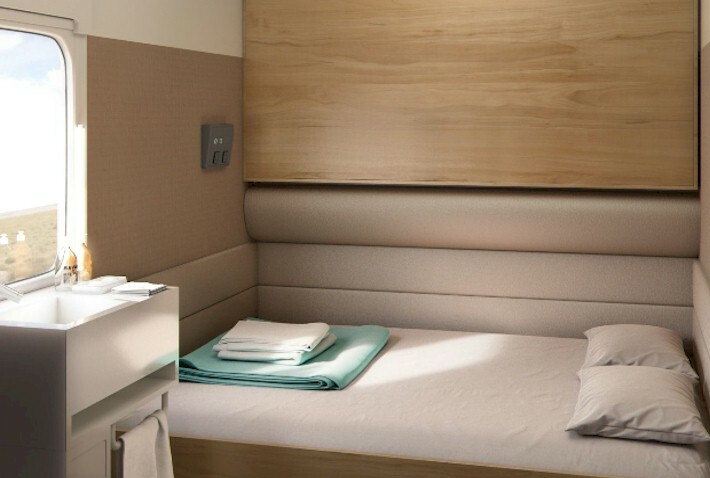 A look at what some of the new Caledonian Sleeper cars will look like coming out in October 2018 -- we got a sneak peak in May 2018! 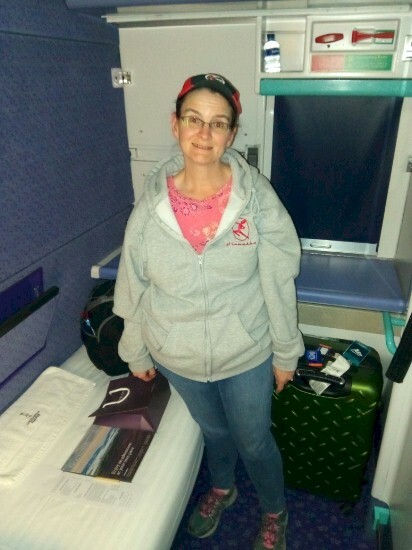 Besides a wonderful overnight train ride, a great conversation with Derek and Kim, and being able to see the new Caledonian Sleeper train equipment through virtual reality headsets… we were also in for an unexpected treat. Towards the end of our meeting, Kandace made the comment to Derek that a lot of people were taking pictures of the engine that was on our particular train set of the Caledonian Sleeper earlier that morning. That jogged Derek’s memory… and he recalled that one of the British Royal Train’s engines had indeed been used as the lead locomotive on our inbound train. 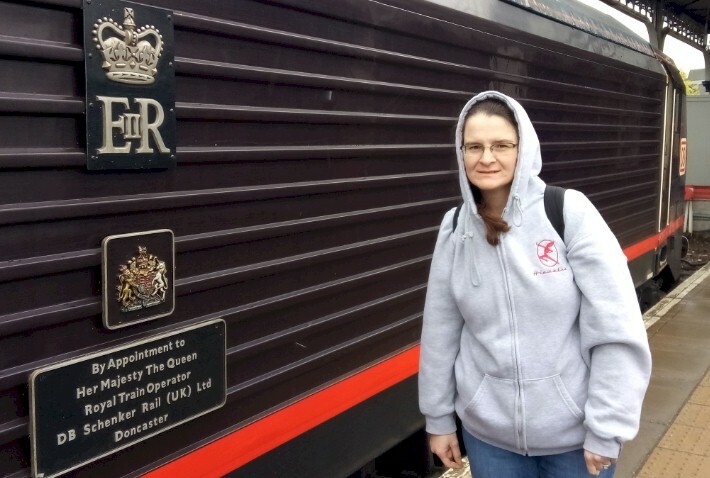 Derek and Kim were able to get us back to the station platform to take some more photos – even both of them were impressed and got personal photos of Engine #67005, called, “Queen’s Messenger”. Engine #67005 “Queen’s Messenger”, along with Engine #67006 “Royal Sovereign”, are painted in the Royal Claret color, and have been used to haul the Royal Train (when in use) since 2003. In the United Kingdom, the Royal Train is used to convey senior members of the British royal family and associated staff of the Royal Household around the railway network of Great Britain. It is currently operated by the German rail haulage firm DB Cargo UK, a subsidiary of Deutsche Bahn. 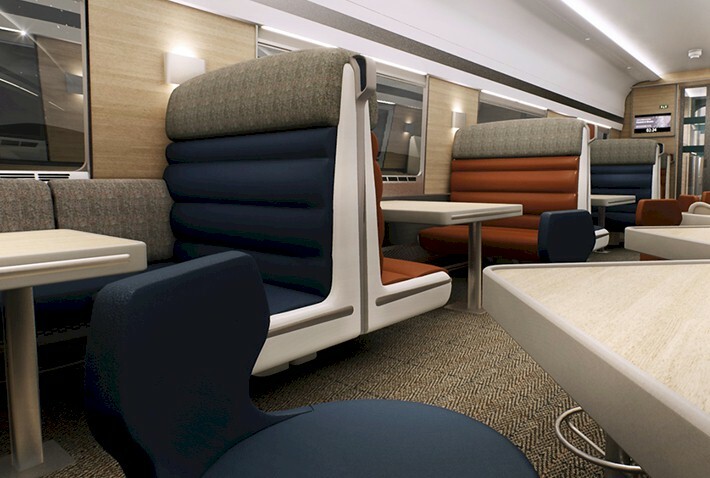 The Royal Train is formed from a dedicated set of sleeper, dining and lounge cars. The current rolling stock of the Royal Train dates from the 1970’s and 1980’s. They are arranged according to requirements, and stored when not in use. 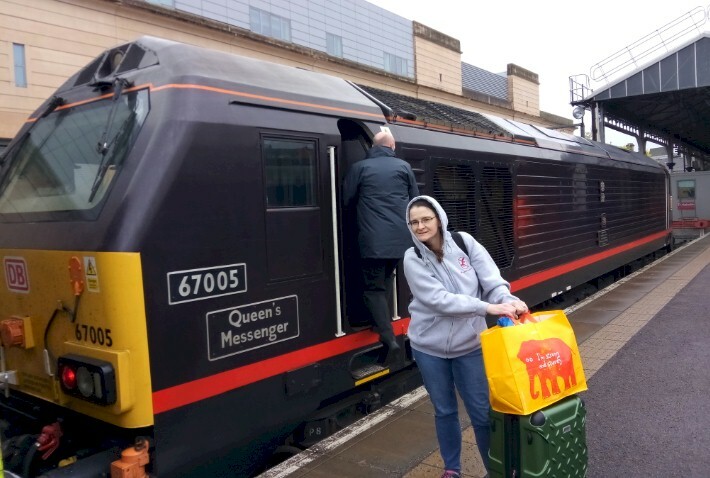 The engines, including “Queen’s Messenger” and “Royal Sovereign”, are used for special charters when not used by the Royal Family… and when there are no charters… they can be used on regular public trains, albeit rare, like our trip on the Caledonia Sleeper. 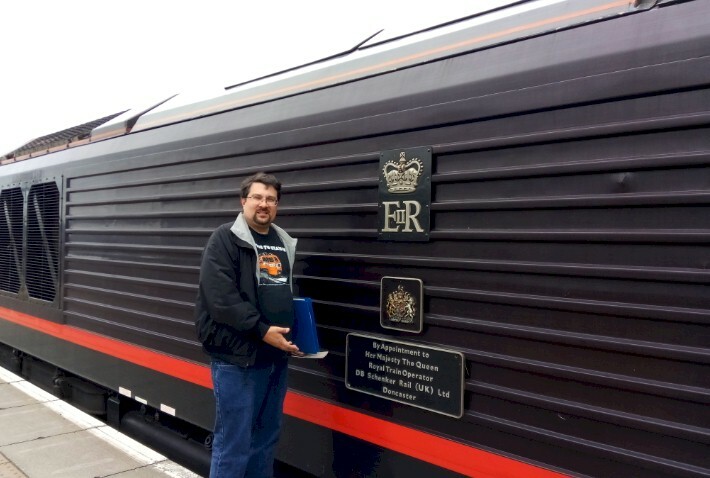 Derek and Kim mentioned that dedicated locomotives have never traditionally been part of the Royal Train, first appearing in special livery only in the 1990’s. Regardless, it was quite a special treat to be hauled by the same engine as the Queen! As the clock creped towards the Noon hour, we bid our farewells to Derek and Kim and headed out to Inverness Airport to obtain the rental car that we would use for the rest of our journey through the Scottish Highlands. We’d like to thank Derek and Kim for their hospitality…. 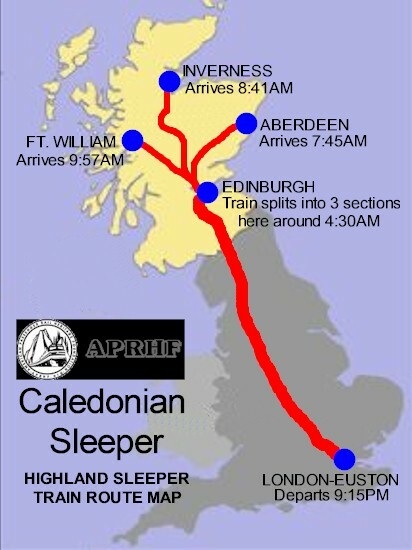 and meeting with us so that we could write about the Caledonian Sleeper this TrainWeb article. Maybe we’ll get back when the new equipment is around and ride again!